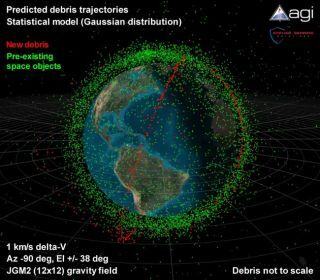 This computer model depicts the new debris from the Iridium-Cosmos crash (in red) on top of the existing debris (in green) in orbit today. STRASBOURG,France ? The Feb. 10 collision of an operational commercial satellite and aspent Russian spacecraft, which has resulted in a decades-long pollution of a widelyused orbit, is raising questions about whether the company whose satellite wasdestroyed had done all it could to avoid the event, according to government andindustry officials. It alsocasts scrutiny on the way the U.S. Air Force disseminates information itcollects on likelyorbital collisions, these experts said. Severalofficials said the collision, which produced two clouds of debris that arerapidly spreading above and below the 790-kilometer-high point of impact, mightbe enough to force the world's spacefaring nations tojoin forces to create a spacetraffic management agency whose data would be available to all nations withspace-based assets. Others wereless optimistic. The dramatic in-orbit collision of the operational Iridium 33satellite with the retired Russian Cosmos 2251 is the third event in two yearsdrawing attention to the orbital debris issue in low Earth orbit. A Chineseanti-satellite test destroyed a retired Chinese satellite and unleashedthousands of pieces of debris at nearly the same altitude in early 2007, andthe U.S. government sent a missile to destroy one of its own classifiedsatellites a year later, saying the satellite's imminent atmospheric re-entryposed a hazard to people. "Arethese enough to dramatize the nature of the issues relating to space security?I'm not sure," said John M. Logsdon, chair in aerospace history at theU.S. National Air and Space Museumin Washington. "Maybe itwill only happen when we face a loss of life, if debris destroysthe International Space Station. Do we have to kill people to payattention? That seemed to be the case with the [U.S.space] shuttle." Logsdonmade his remarks Feb. 20 during a space security conference here organized bythe International SpaceUniversity. The U.S.Air Force is willing to help coordinate an international effort to create aspace traffic management system whose goal would be to reduce the chances of arepeat of the Feb. 10 collision, said Air Force Brig. Gen. Michael J. Carey,deputy director of U.S. Strategic Command. The AirForce has neither the resources nor the political mandate to stand watch overall commercial satellites, and the collision illustrates "the need to makeinformation sharing more international," Carey told the conference Feb.18. "If we don't operate safely in space then we don't have assuredanything in space. We need a broader international engagement. We are activelyseeking opportunities to put a coherent plan together." But severalofficials questioned whether Iridium Satellite LLC has devoted sufficientresources to protecting not only its 66-satellite constellation, but the entireorbit in which it operates. The collision will render the Iridium orbit a moredangerous place to operate for all satellites, especially Iridium. Onegovernment official said a preliminary analysis suggests the several hundredpieces of debris createdby the collision have roughly doubled the likelihood that another Iridiumsatellite will be struck. The Iridiumvoice and data communications constellation is operated by Boeing SatelliteOperations and Ground Systems of Leesburg, Va. Boeing officials declined tocomment on the events leading up to the Feb. 10 collision. Liz DeCastro, spokeswoman for Bethesda, Md.-based Iridium, saidIridium also would decline to discuss in detail what collision-avoidancemeasures it takes to protect its fleet and the orbital environment. "Regardingthe sequence of events that led to the collision, we may never know exactlywhat happened since we had no heads-up that it was coming," DeCastro said. "Our team that monitors ourconstellation saw that the satellite was missing when it went missing. Wedidn't move the satellite because we didn't know we had reason to." Otherofficials cast a different light on the subject. The French space agency, CNES,which operates 15 satellites in low Earth orbit and tracks possible collisionthreats, reviewed the publicly available U.S. Space Surveillance Network datafor the Iridium and Cosmos satellites that was released in the days precedingthe collision. This same information is available to Boeing and Iridium. Monique Moury, who works in the operational flight dynamicsdirectorate at CNES, said the raw data alone coming from the U.S. Air Forcewould have been sufficient for CNES to perform a more-detailed analysis of thepossible collision threat if the satellite in question had been CNES-controlled. The U.S.Air Force data, called two-line elements, suggested that the likelihood of acollision between the Iridium and Cosmos satellites was 1in 10,000. Given the known imprecision of thetwo-line-element data, that level of warning is enough to force CNES to take asecond look, Moury said Feb. 20. UnlikeIridium, CNES has at its disposal ground-based radars that, when used inconjunction with the U.S. two-line-element data, can provide a more-preciseassessment of whether a given satellite faces a problem serious enough towarrant a collision-avoidance maneuver. WhetherBoeing and Iridium take two-line-element data into account in flying theIridium constellation is unclear. Iridium's satellites were launched between1997 and 1999 and designed to last for just five years. All are thus well pasttheir planned service lives. Iridium officials have said in the past that theyand Boeing do their utmost to save fuel, and have had to use fuel on somesatellites to compensate for the loss of moment wheels, which provide satelliteattitude control. For aconstellation in low Earth orbit, two-line-element data would present potentialcollision alerts so often that Iridium cannot respond to each one with adetailed examination and possible evasive maneuver, industry and governmentofficials said. "Theywould be reacting so often they wouldn't do much else," said Brian Weeden of the Secure World Foundation, which the week ofFeb. 16 proposed a global space traffic management system to the U.N. Committeeon the Peaceful Uses of Outer Space. Weeden said Feb.20 that each operator is free to take two-line-element information intoaccount, or not. "Thereis no real industry standard for how to react to two-line data," Weeden said. "It comes down to each owner-operator'scost-benefit analysis." In addition to the use of fuel in performing anavoidance maneuver, a serious attempt to track threats for a constellation likeIridium would involve substantial spending on technical expertise, Weeden said. Carey saidthat while the U.S. Air Force has compiled a catalog of objects being trackedin space, "we don't do conjunction analyses for all 18,000 objects in thecatalog. Our first priority is human spaceflight. The next is our nationalsecurity assets. Then you get to where you run out of opportunity and time todo conjunction analyses on all operating spacecraft. It would be a dauntingtask, and it's one we are not assigned to do." But thepublished two-line elements are not the only database the U.S. Air Force regularlycollects from its ground-based sensors. A second, more-precise database of thesame population of orbital objects is also kept but is made available only inexceptional circumstances. This high-accuracy data is viewed as being toomilitarily sensitive to release publicly, officials said. Commercialsatellite operators may ask the Air Force to check the high-accuracy databaseto determine whether a given satellite faces an especially high probability ofcollision. Weeden said that in these cases, the AirForce takes the satellite operator's information and then performs a checkagainst the high-accuracy data before returning a higher-reliability threatanalysis. But theprocedure can take days ? too long to help operators of satellites in low Earthorbit. For these operators, the maximum time they have to react is about a weekfrom the time they receive the basic two-line-element data until the time ofpotential impact.